The purpose of this book is to provide a unique and standard textbook that will meet the needs of students in Principles of Accounts and Financial Accounting in Senior Secondary Schools and Tertiary Institutions.The book covers every aspect of the new National Educational Research Development Council Curriculum for NECO, WAEC AND UTME Syllabus.The book is designed for senior secondary school students and undergraduate students of Accounting, Business Education,Finance, etc. 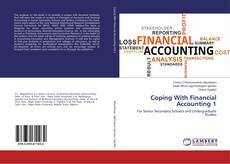 in the universities as well as Practicing Accountants and Curriculum Planners.It is the belief of the authors that the book will be of immense assistance to undergraduates in Accounting Education and Management Sciences. It will also be useful to first year students of polytechnic and colleges of education, as well as students preparing for professional examinations like ICAN,NIB, ACCA, etc.However, all errors are entirely ours and we encourage readers to forward their comments and complaints to us through the publishers.